Montréal Serai editor Nilambri Ghai had the opportunity to interview Serena Sial about her recent experiences in Russia. M.S. Serena, you have achieved a lot within a short period of time: a degree in Engineering from Concordia University, a degree in environmental studies from York University, a degree in law, admission to the bar in 2010, and a promising career in the Department of Justice up by Parliament Hill! But you gave all this up to travel, to teach English online to adults, and to explore new horizons. Recently you have been in Russia, and are going back in March. What is it that inspires you to make the kind of choices you make? 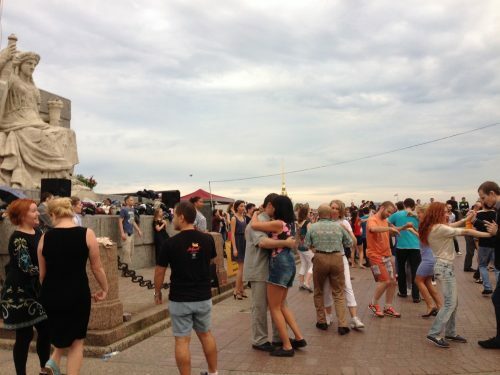 What is it that attracts you to Russia? I am asking because there is little today that you read about Russia that is positive, from the doping scandal in the Olympics to the carnage in Ghouta, where Russia is fighting with Syria and Iran not far from a coalition force led by the US! It is an international crisis waiting to explode into “chaos” – a word bandied about dangerously by the world’s most powerful. Tied to this are multiple investigations into Russian collusion, hacking, leaking of documents, and propaganda – a world gone mad over the race for “impenetrable” nuclear weapons. It would be difficult to imagine a more “holier than thou” approach demonizing one side as being all “bad,” while idolizing the other as being all “good.” And no attempt is being made to identify any shared needs, locating a meeting point that brings us back to our essentials as human beings. I am looking forward to hearing about your love for Russia, and your interaction with its people. S.S.: I’m a curious person. I enjoy exploring what is unknown to me or confronting something unexpected. A certain element of uncertainty and adventure motivates me. My appreciation for Russia and Russian culture came about this way. Through my work, I began to teach English online to several students in Russia. I realized how little I knew about their culture, and how few Russian people I had really ever met. I was immediately struck by the warmth, humour and sincerity of my students. I realized that, but somehow, I hadn’t expected that. They were also curious about me – wanting to know about my Canadian and Indian backgrounds. Many of these relationships developed into genuine friendships, and I think it was their kindness and energy that inspired me to visit Russia. S.S.: I think Sergey’s comments relate well to this. 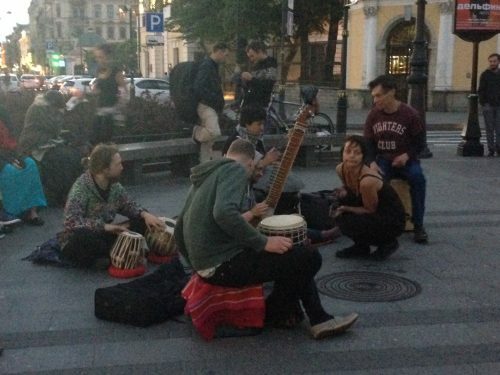 When I stayed in Russia, I was amazed by the diversity within Russia. It’s such an enormous country with borders touching so many others. The extent of diversity seems endless to me. There is beautiful throat-singing music that comes from the regions of Russia that border Mongolia (for example, the musical group, Huun-Huur-Tur). I have a dream to travel to the eastern-most parts of Russia, cities like Vladivostok, where you can take a cruise boat to Korea or Japan. Once I saw a young woman at my school in Saint Petersburg whom I immediately took as being from India. When I asked her where in India she was from, she responded in Russian that she was from Ufa, Russia. It was a learning experience for me! I also learned about Georgia while there – a beautiful, small country bordering Russia to the south, where I later lived for 8 months. I was prompted to go to Georgia by Russian friends who described it as an oasis in Eastern Europe, full of green mountains, friendly people and delicious food. I would add that Tbilisi, the capital, is an artistic and fashionable city and the Georgian language is completely original – unlike any language you hear anywhere else in the world. Although both Russia and Georgia are part of the former USSR, I was impressed how completely distinct are the cultures, landscapes and languages of the two countries. My grandmother and grandfather lived in the North Caucasus. We lived in Ural. From September to May we studied in school, and when the summer started, we would go to our grandparents. They lived in their own house with big fruit trees and with a lake behind the garden. We took sunbaths, we ate a lot fruits and fresh vegetables and berries, [and] we helped our grandparents, of course. We looked after animals like ducks, pigs, cows, chickens. That was an interesting experience for us because we lived close to nature, we became healthy and happier, and my grandparents taught us so much. In my opinion, most of the people from Russia think like me. We are friendly people, we want to have good friendships with all people, from all over the world. We are not politicians. We have a big culture and a great heritage from our ancestors that is so important for our country. Our nation is strong, and all the cultures [within Russia] support each other. We have a large territory with many natural resources – we are proud of this land. M.S. : What about life in a big city? Were you ever scared since you placed yourself in a new country, a new culture, a new language? 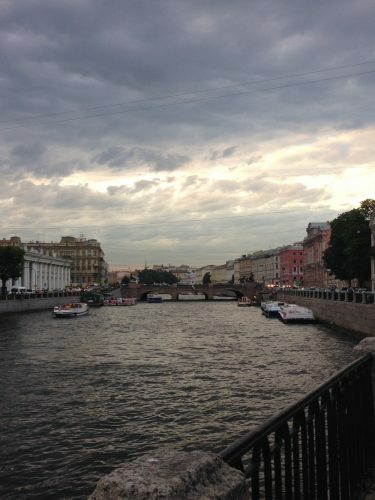 S.S.: Life in Saint Petersburg, where I lived for 3 months, is not unlike life in any big city in the world. 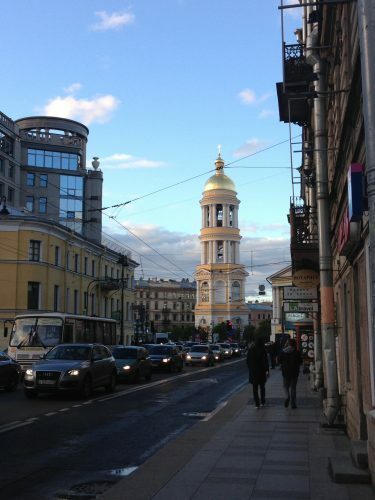 I lived downtown in one of the central areas of Saint Petersburg. It was a busy neighbourhood with great cafes, restaurants and shopping, all within walking distance. Saint Petersburg is a city of canals and bridges, lovely to stroll through. My apartment was renovated – cozy and comfortable by any standard. During those days, I was studying Russian at a local university. The university has a great language program for foreigners, where I met interesting people from all over the world. My classmates were from Greece, Poland, Colombia, Mexico, and I also often bumped into students from different parts of Africa and the Middle East. I quite loved the curious reality of all of us trying to converse with each other in Russian. I travelled to school each day by metro. The metro systems I encountered in Moscow and Saint Petersburg are amongst the most efficient I’ve ever used. In all my time there, I never waited more than a few minutes for a train. Moscow is known for having some of the most beautiful metro stations in the world, though I never got to visit them myself. On my days off, I enjoyed excursions to the symphony, ballet, or just walking through city parks. One of my favourite places in Saint Petersburg is the Russian Museum where I could wander for hours. The city is full of culture and charm and very liveable for a foreigner. People are kind and helpful. I felt as safe there as anywhere. While in Russia, a friend from Japan came to visit me. We travelled together to Novosibirsk to visit a student of mine, Alex K., who, until that time I had only ‘met’ online for our lessons. Alex invited me to his home with so much sincerity and expectation. I was honoured to make the trip from Saint Petersburg across more than 3,000 kilometers and 4 time zones to meet him and his loving family: his wife, Lyudmila, and their two-year-old daughter, Rita. Being invited into their home was really special for me. When we had dinner together, I remember a moment where I was overcome by how natural it was, how safe I felt, the feeling of family that they shared with me, and the almost surreal fact that this was occurring in Siberia, in the middle of Russia! In the span of two days, Rita was calling my Japanese friend ‘uncle,’ and we had solidified a bond that I will cherish always. Sergey K, another student, has also become a valued friend of mine. It turns out that Sergey, a Russian man from a small town in Siberia, and I, from the suburbs of Montréal, have much in common, including our desire to travel, our musical interests and our love for each others’ languages. Sergey responded to my visit to Russia by organizing a visit of his own to Canada. Shortly after I returned to Montréal from St. Petersburg, I was touring with Sergey and his friend Dimitri through the streets of Montréal, Ottawa and Toronto. The awe and curiosity I had felt in Russia, they were able to experience as they explored Canada for the first time. That’s the power of human connection; our bonds inspire us to learn about and understand each other beyond the stories in the media. M.S. : Tell me about your upcoming project in March. S.S.: It’s a dream project. A few months ago, I knew I wanted to return to Russia ideally to volunteer. After randomly sending out queries to almost a dozen organizations, the first one that responded was for a teaching opportunity in a rural community outside Moscow. The main concept of the community is to provide orphans in Russia a holistic, safe and community-driven environment where they can develop. Orphans are invited to reside in the home of one of several foster families that live in the community. As a volunteer, I’ll live in a home with one of these families and teach English at the local school. It’s also asked that I assist in sustaining the community: working in the kitchen, helping in the garden or with other odd jobs. I’ll have the opportunity to spend time with the children, to learn about foster parenting, and to practice my Russian language skills. It all sounds wonderful to me – I’m so thankful for this opportunity. S.S.: The people I know in Russia are very dear to me. Through them, I have come to feel sentiments of love for their land and heritage. I wish for them to have opportunities in Russia to realize their dreams and prosper, just as I know they wish that for me in Canada.